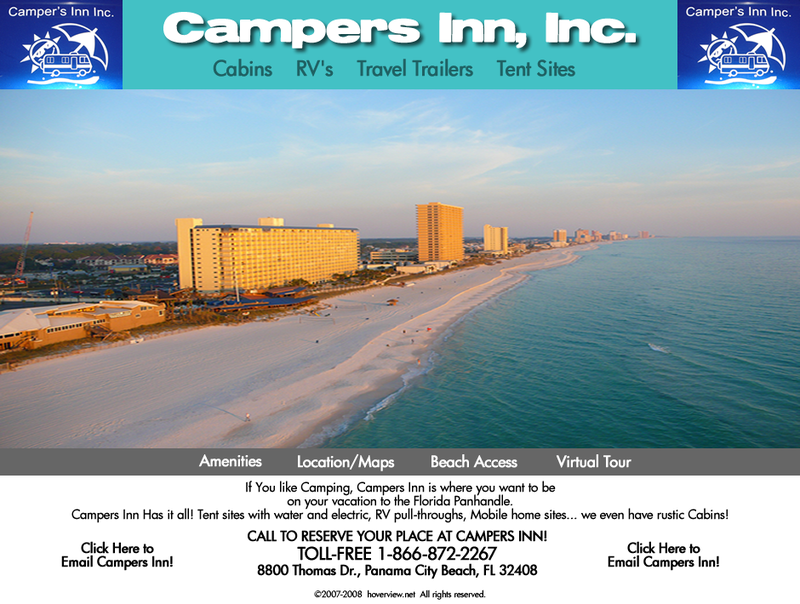 Campers Inn offers Panama City Beach vacationers several choices to accommodate your camping needs. 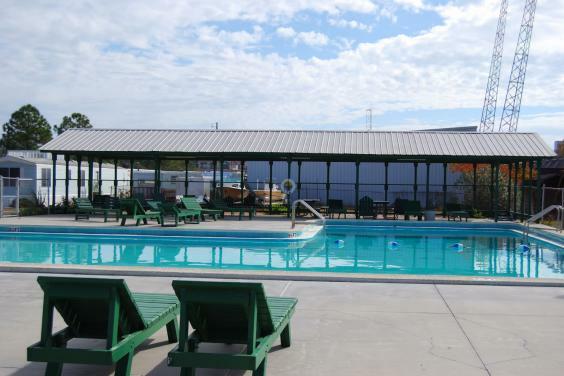 Our full service RV resort offers all the amenities and services that go well beyond the average RV Park or Campground. 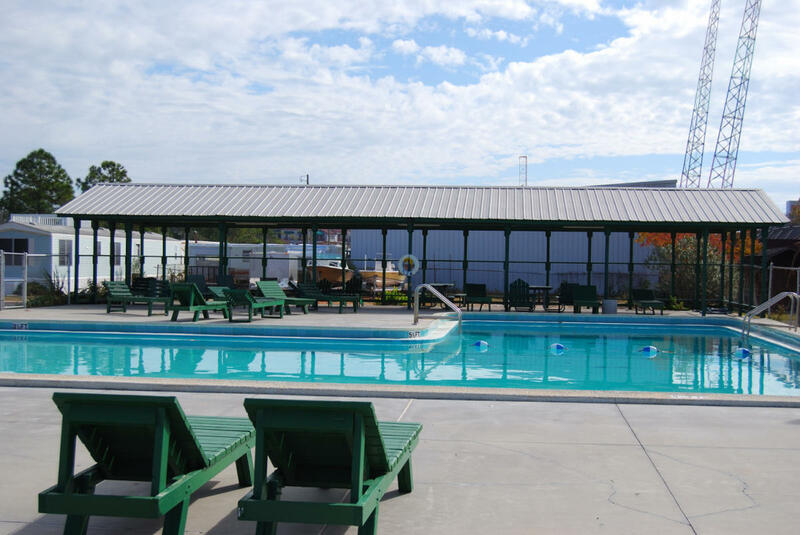 Campers Inn RV Sites At Campers Inn we offer a variety of spacious "Big Rig" friendly RV Sites, which include numerous easy access pull-thru spaces. 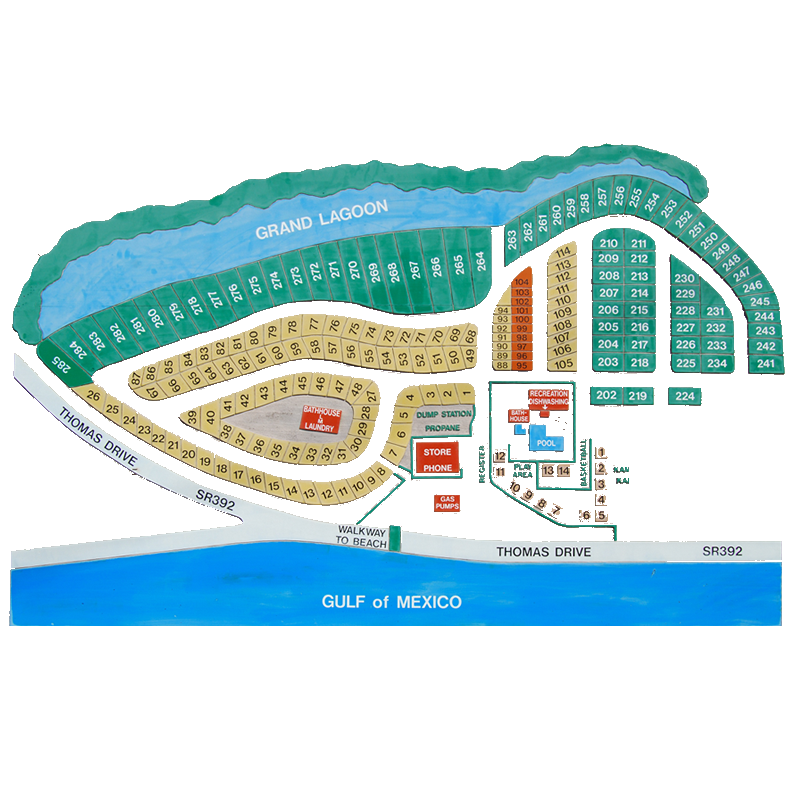 Each of our nearly 100 spaces are level and paved with an additional concrete patio area, as well as a picnic table. All spaces have standard water/sewer hook-ups, 30 or 50 Amp service, Wi-Fi service, optional cable hook-up, and some provide just the right amount of afternoon shade. 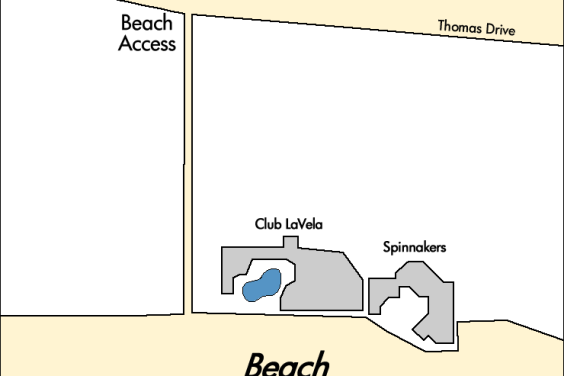 The majority of sites are directly across the street from our beach access path. 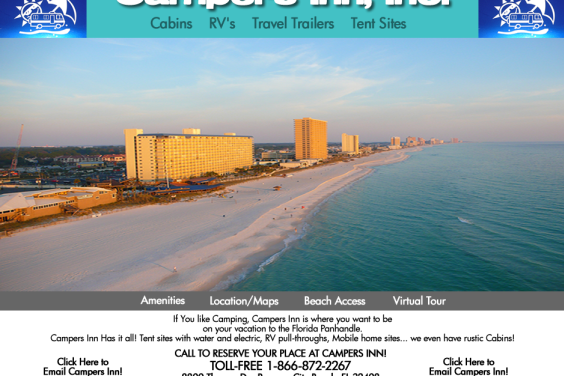 At Campers Inn we can offer you a unique beach camping experience! 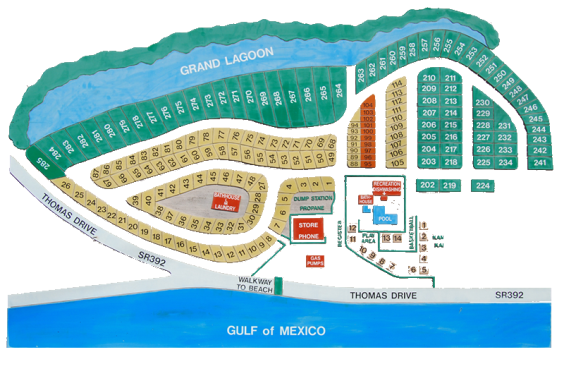 If you are looking for that rustic camping outing with the family or a couple of friends, we have 14 beach cabins just steps away from the pool and our playground area for the kids. These simple accommodations are approximately 12 ft x 14 ft and include power, air conditioning, and lighting. Think of it as a step up from a more primitive campout, you still need to bring all the same supplies as you would for a tent camping outing. Please make sure you bring your own bedding, ice chests, etc., but you will have the advantage of a few extra modern conveniences. Each Cabin can accommodate up to four people. All tent sites include water and you have an optional choice to add power for a few extra dollars. 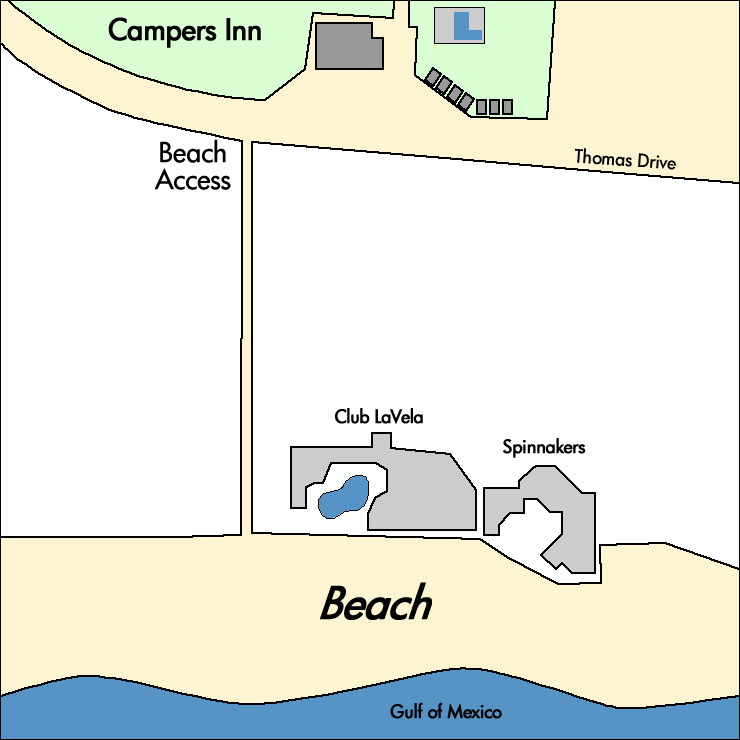 Our tent camping area also features a community BBQ and Picnic area for larger groups, close to the Pool, showers, restrooms, and other amenities. Most importantly there is plenty of SHADE!